A few months ago, I shared one of my absolute all-time favourite spaces with you all; Louisa Pierce’s Nashville home. Despite being a modern build, the house is layered so beautifully with texture and tiles, it felt difficult to put a time period on it. Louisa’s eye for finding unique pieces and blending them together in a wonderfully odd way led her to co-found design company Pierce & Ward along with pal, Emily Ward. Together the duo have spent the past few years revamping homes until they burst with personality. So far, each project I’ve seen them to seems to mirror the personality of the client well; Lily Aldridge and Caleb Followill’s is feminine and elegant yet quintessential southern. Black Keys’ drummer Patrick Carney’s home is a little bit rock ‘n’ roll. Pierce & Ward seem pretty darn good at designing for the client’s coolest qualities. 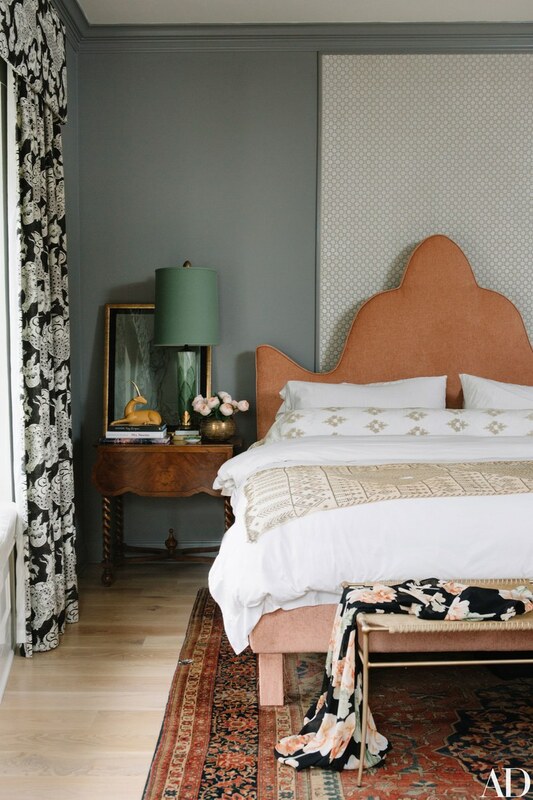 When it came to designing the Nashville home of model and musician Karen Elson, Pierce & Ward did that they did best; captured her personality and translated it to interiors. They designed a family home inspired by Karen’s English upbringing, her love for textiles and her creative interests in music, art and fashion. 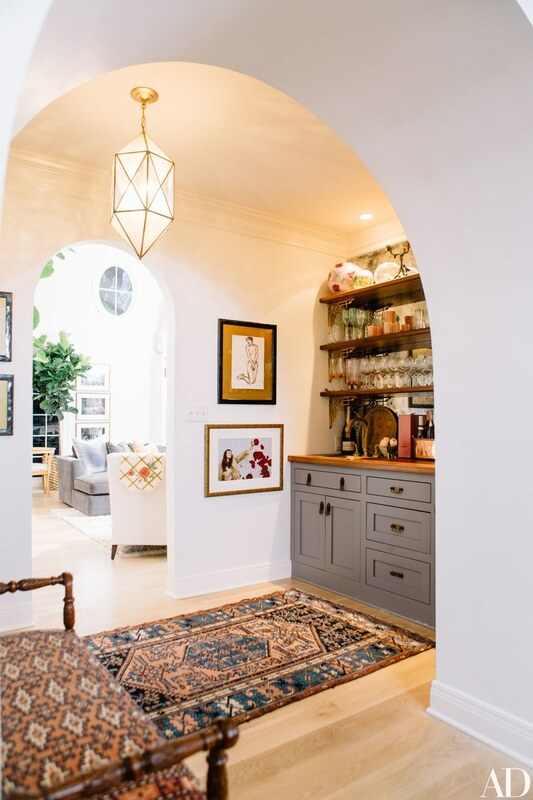 The result was a theatrical yet homely space perfect for entertaining. Take a look! Photography by Leslee Mitchell for Architectural Digest. A La Cornue range like this one has been on my wishlist for years (and unfortunately because of the price, will probably stay on the list and not in my future kitchen. *sigh*), but it was a brand Karen was unfamiliar with. Pierce & Ward suggested installing one in the kitchen and Karen happily agreed, deciding that it was “as close to an AGA stove that I could find Stateside”. 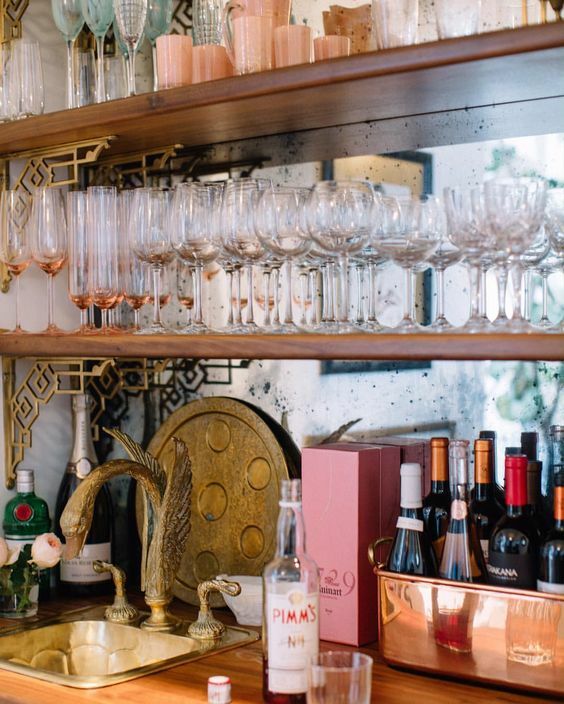 Wet bars (a home bar area with plumbing for emptying glasses and filling water) seem to be a Pierce & Ward staple. It's as if they just want to help their clients be able to throw parties. Now THAT'S what I call good client service! And can be all just pause for a moment to appreciate the splendor of this antique brass swan tap?! The design duo mixed an eclectic collection of antique furniture to create several seating areas. One by the fireplace, one by the window- ideal for cozy chats and large flowing parties. Karen's office area is where she retreats to find some solitude and write music. The room is covered in "irreverent" wallpaper by illustrator Costanza Theodoli-Braschi that she chose to hang here, worried that “it wasn’t exactly appropriate for the sitting room”. Meh, I've seen worse. Her desk area leads on to the super luxurious bathroom. A Moroccan bone-inlaid stool, Persian rug and monochromatic tiled floor add plenty of character. 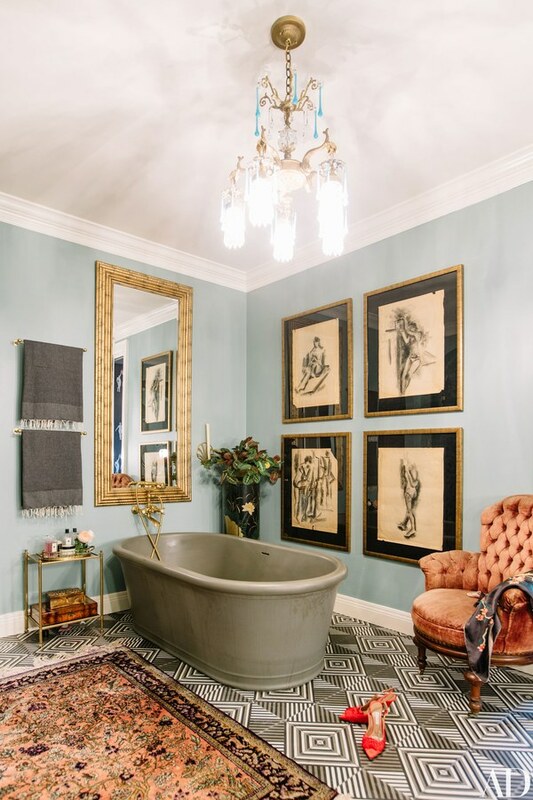 There's something very 'Old Hollywood' about this bathroom. The velvet chair, the gold sidetable... The fact that it's so much more luxe than your standard place to hose down. I just love the collection of pieces on top of the antique barley twist table, especially the hand-painted 1950s lamp from France. The perfect spot to keep a console table: as you enter your bedroom and need somewhere to drop your keys, yet out of sight from the bed so that the room can remain your uncluttered little sanctuary.